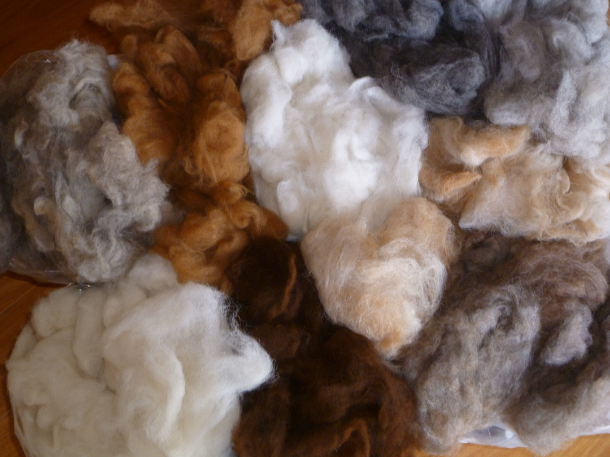 We are pleased to introduce carded alpaca fibre. All fibre is from our own animals grazing in the Southern Highlands of New South Wales. Fleece is shorn, then skirted, hand picked, hand washed and carded to produce a unique soft and luxurious fibre. Ideal for Handspinning and Felting. A variety of natural colours is available in clear plastic packets of 200g for $20.00. Postage and Handling extra. An example of the many natural colours available – samples can be forwarded upon request.